QR Code is a widely used two-dimensional barcode type. It can be seen everywhere in daily life and enjoys wide widespread adoption, such as streamlining customer's visit, reinventing shopping experience, providing real-time information (V-card) and so on. All these things can be conveniently done by scanning QR Code barcode images. Then, do you want to make things easier with QR Code symbol recognition? If so, please try pqScan .NET Barcode Scanner SDK. This .NET Barcode Reading SDK is developed in Visual C# programming and completely comply with .NET Windows desktop and ASP.NET web applications. Various QR Code scanning features can be realized by well-compiled APIs. You may see detailed features and APIs below. In all, six main .NET APIs will be implemented in QR Code 2D bar code scanning application. The first three .NET barcode recognition APIs are used to scan and read (all) QR Code 2D barcode(s) from image of Bitmap, Stream, and disk picture. The barcode reading result will include barcode data and barcode type (QR Code). The second three reading APIs are used when you are sure what bar code type(s) are on your target images. The last three APIs can be to improve barcode recognition accuracy when there's only one barcode on your image. pqScan .NET Barcode Scanner Toolkit supports several common raster image sources, including bmp, jpg, jpeg, png, tif, and gif. Now, you are also able to read QR Code from PDF document file. As stated in QR Code Scanning Feature section, all .NET QR Code barcode font detection result will be in the form of array. To have a better understanding of QR Code 2D bar code, you may have a better control on your .NET barcode recognition application. If you are still not familiar with this barcode, please refer to Wikipedia QR Code introduction page. Of course, we provide 24 hours contact support. If you have any question that related to QR Code or pqScan .NET Barcode Scanner SDK, please do not hesitate to contact us. Here, you can go to How to Scan QR Code Barcode in C# & VB.NET page for more coding help (demo codes are provided). In addition to QR Code, our .NET barcode scanner control library also supports other two-dimensional barcode types, most importantly, like PDF-417 and Data Matrix. You may see detailed PDF-417 recognition guide and Data Matrix recognition guide from navigation bar on the right. 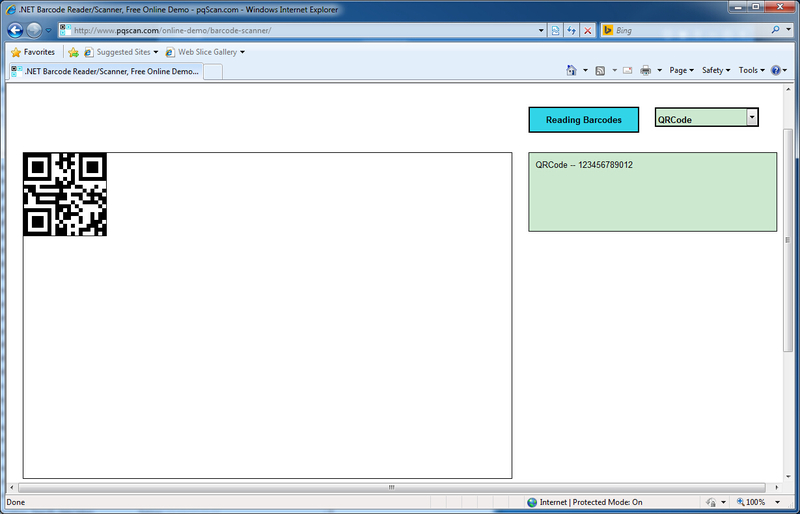 More related online tutorials my help: How to Scan Barcode in C# and How to Scan Barcode in VB.NET. Help you to build perfect quality software in a quick and simple way. SUPPORT SYSTEM: MICROSOFT WINDOWS XP, WINDOWS VISTA, WINDOWS 7, WINDOWS 8, WINDOWS SERVER. SUPPORT PLATFORM: .NET FRAMEWORK, VISUAL BASIC, VISUAL C#, ASP.NET, JAVA, JDK, SWING, APPLET, JSP, SERVLET, J2SE, J2EE. SUPPORT BARCODE TYPE: QR CODE, DATA MATRIX, PDF417, AZTEC CODE, CODE 128, CODE 39, CODE 93, CODABAR, EAN 13, EAN 8, UPCA, UPCE, ITF14. SUPPORT IMAGE FORMAT: JPEG, JPG, PNG, GIF, TIFF, TIF, BITMAP, BMP. SUPPORT VIEWER: MOZILLA FIREFOX, INTERNET EXPLORER, GOOGLE CHROME, OPERA, SAFARI, ADOBE and ACROBAT PDF. Copyright © pqScan 2010-2019. All Rights Reserved.